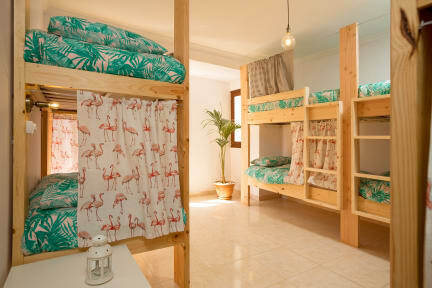 This charming hostel is located in the neighborhood of Guanarteme and Playa de Las Canteras beach. There are 3 floors: ground floor (dinning room, sofas, projector, laundry area, coworking space, surfboard & wetsuit storage…), second floor (dinning room, bathrooms, toilets, showers, rooms and kitchen) and rooftop (big terrace with seaview to the best surf spot of the island, La Cícer). This is a beach hostel, just few steps away. It’s plenty of restaurants, bars, nightlife, surf schools and many other facilities. Public transport works very good from the hostel. In addition, some of the best attractions of the area are near to our facilities such as Castillo de la Luz, Alfredo Kraus Auditorium and Castillo de la Luz, amongst other interesting spots of our area. 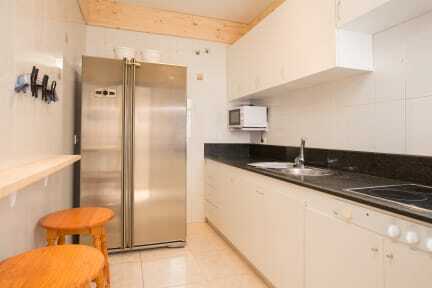 We have several dorms with several capacities in order to fit the necessities and wishes of our guests and travellers. In addition, we have several common areas where the guests can get together and exchange past experiences and future plans. This property might pre-authorize your credit card. In case of payment of failed payment, we will contact you, and if we don't have an answer after 72 hours we will cancel the booking. The reception is open 09:00 - 22:00 every day. Self check-in after 22:00, send us an email for more info. No curfew, we give a key to every guest. We do not accept customers under 16 years old.